There are two pheasants and four partridges hanging in my garage at the moment. They were kindly given to me by a friend and local beater, Andy. Today and later this week there will be pictures of the birds and their preparation on my Flickr account. I tell you this partly because the meat-eaters amongst you might be interested in looking at them but, mostly, to forewarn my vegetarian/vegan readers that they might want to avoid the photos named after game birds. Love game. Thank you for sharing. Such a beautiful picture! As are all the pictures so far. I am loving them. 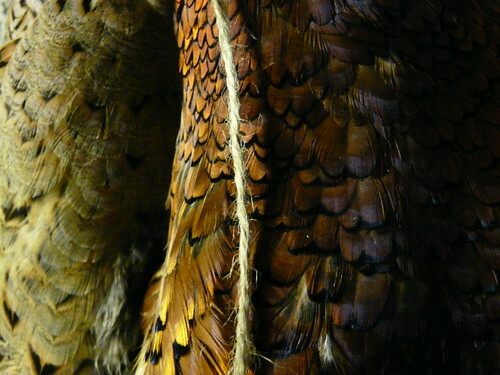 What stunning colours on the feathers. I bet they will taste fantastic, I love this time of year! Ah, now I see. Your garage. They are gorgeous Wendy. The ones that are hung, against the grey wall are beautifully compsed. Who shot them? What stunning photos! Just beautiful. Very envious too – I’m sure they will be wonderful. Lucy V – Me too. Feel very fortunate at the moment as so much of it is coming my way. And for free too! Helen – The colours are amazing, aren’t they? Love the contrast between the sexes. Lucy – Thank you. 🙂 My friend Andy works on an estate where people pay to shoot and he can take home any birds that the guests don’t want. Apparently, only the Italians take home everything! We’ve been eating free partridge, pheasant and pigeon all autumn. Sarah – Partridge is lovely. Like fragrant turkey. Antonia – Thank you! Was surprised how well the photos came out. May photograph more in my garage!